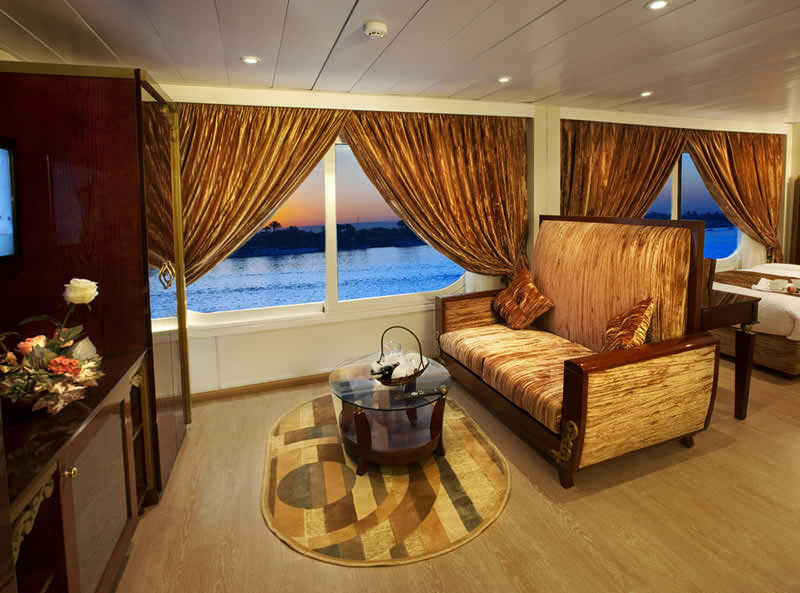 The M/S Alhambra, introduced on the 28th of April 2010 is a luxurious ship, growing in popularity in the Nile cruise industry. 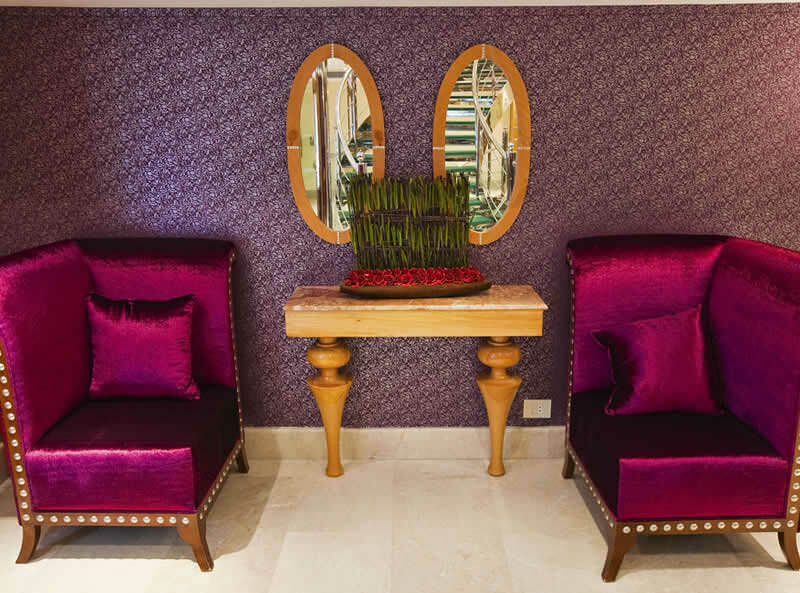 It offers much to do such as a two level spa with a swimming pool located indoors, an amazing fitness centre and many other magnificent facilities. 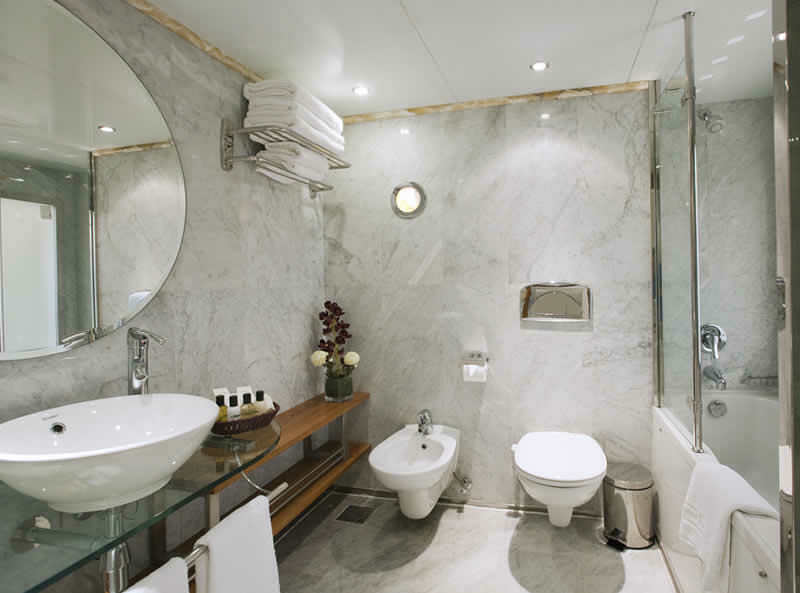 The 4 deck ship contains some of the largest suites found on Nile cruises with vast amount of bathroom space unusual to most Nile cruises as well as spacious, comfortable suites. 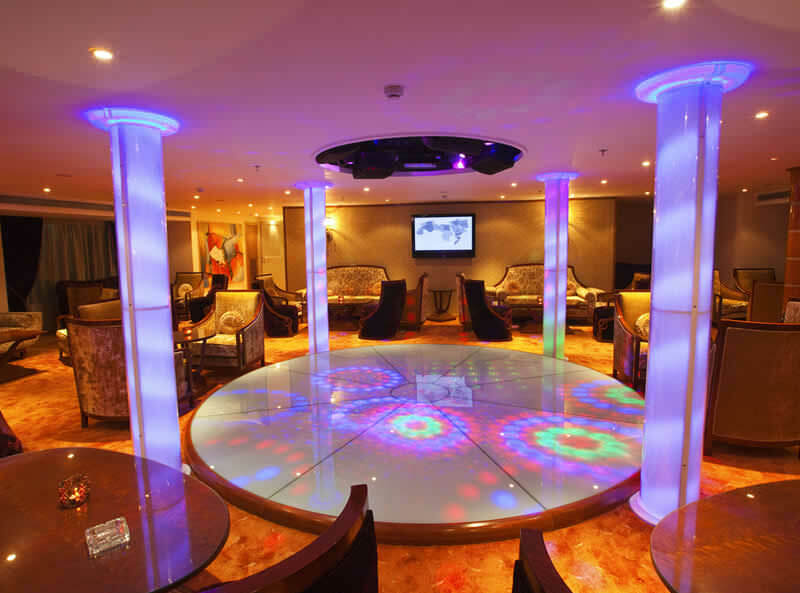 There are 3 decks along with the sun deck. 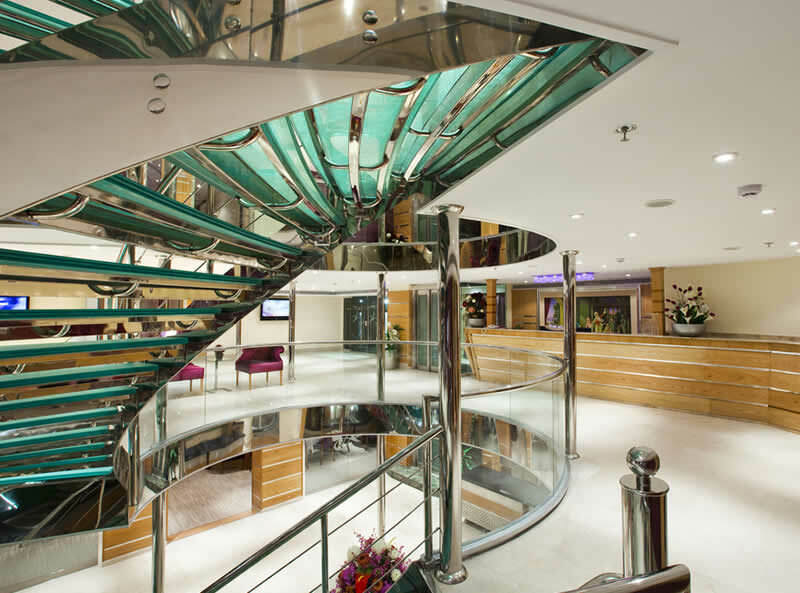 The reception desk known as Al Sultan deck has 12 suites each at 31m2, then the second deck known as Al Wazir holds 16 suites each at 36m squared, then finally the third deck called Al Khalifa has just 6 suites each at 42m squared with 2 for accessible at 51m. 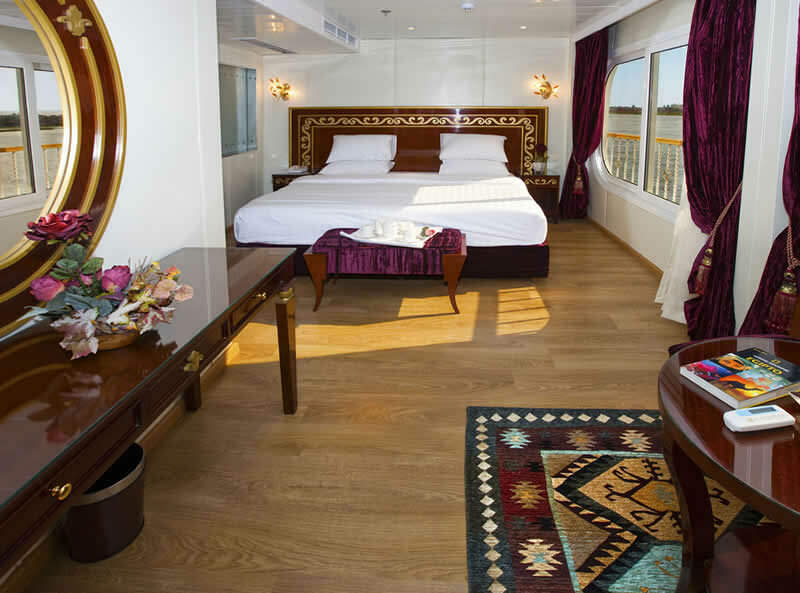 On this ship guests are able to cruise in luxury feeling like royalty as they explore the wonders along the River Nile. 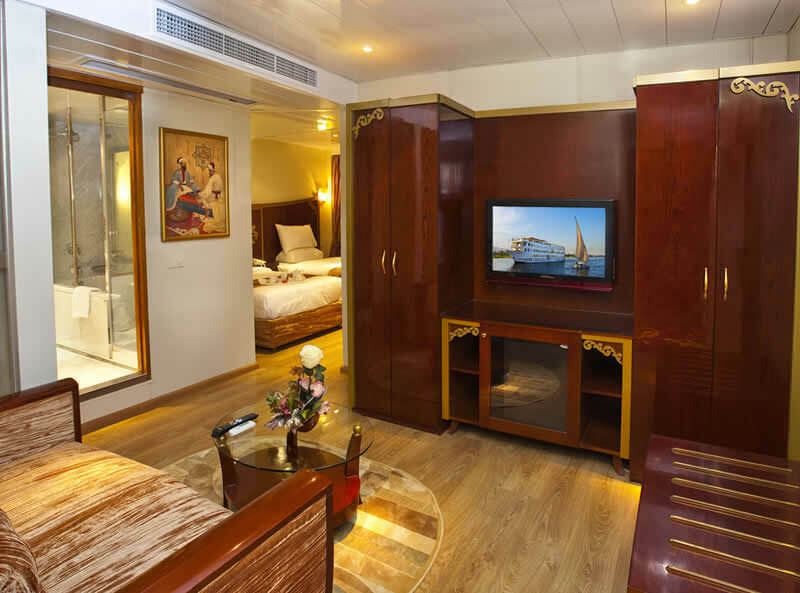 All 42 suites on board are of an exceptional size for a Nile Cruise ship, starting from 31 sq.m and going up to 51 sq.m and all have a large private bathroom. 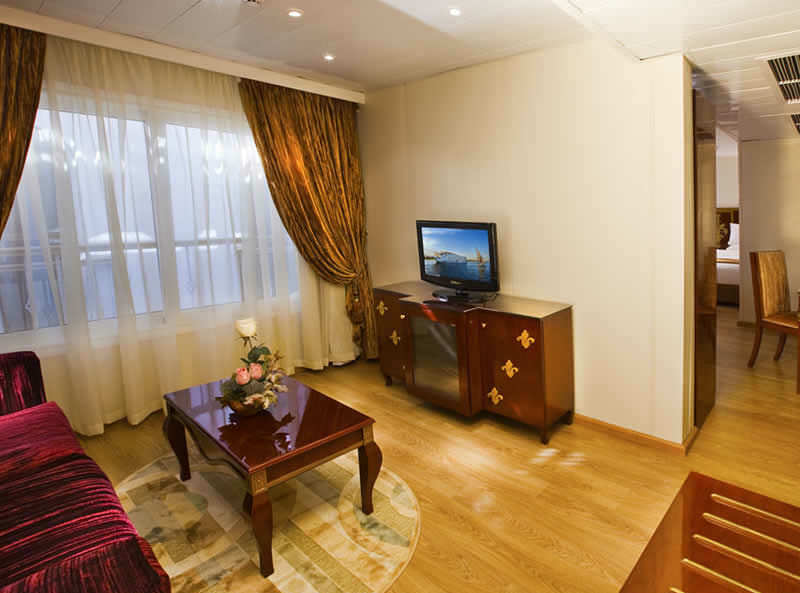 The suites are equipped with high speed Wifi, a 32 inch LCD TV, marine satellite reception for International TV channels, direct dial telephone, safe, mini bar. 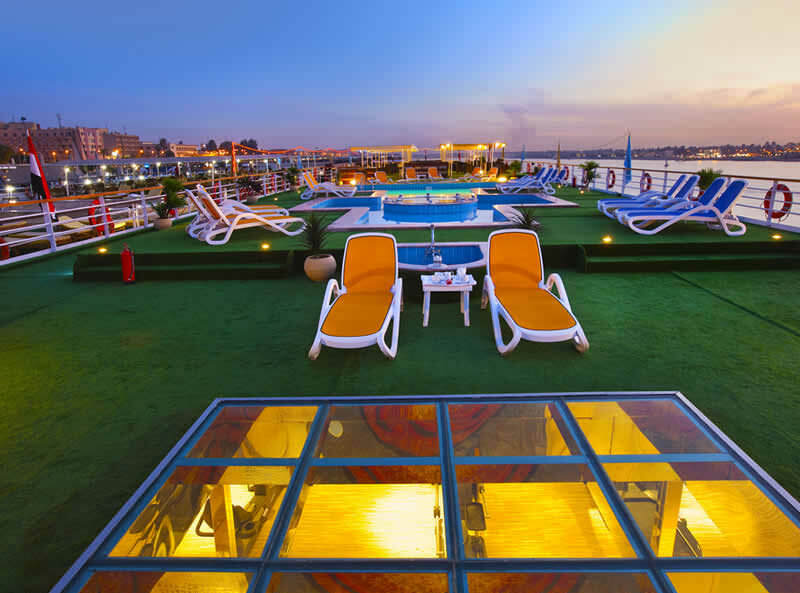 Upon arrival at Luxor international airport, Cyplon Holidays representative will be waiting to greet & assist you, then you will be transferred by A/C coach to your Cruise Boat in Luxor to check in and stay overnight. 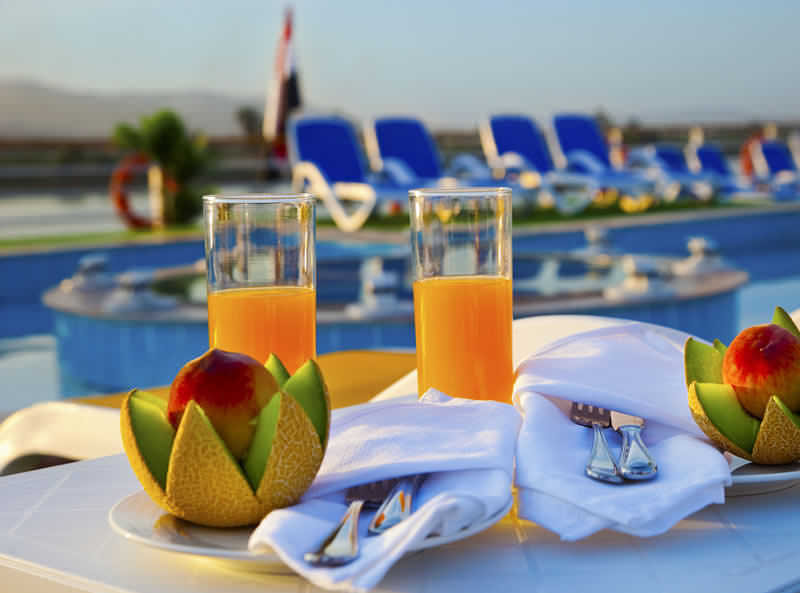 Enjoy your first Egyptian sunrise, followed by a visit to the West Bank the Valley of the Kings, the Temple of Hatshepsut and the Colossi of Memnon. Afternoon sailing to Edfu via Esna lock. Overnight in Edfu.Overnight in Edfu. Morning visit the extraordinary Temple of Horus, the mythical son of Isis and Osiris. Here, according to myth, Horus avenged the murder of his father Osiris by defeating his father's brother Seth in combat. Sail on to Kom Ombo to visit the Temple of Sobek and Haroeris. Visit the High Dam - finished in 1971; it has ensured up to three harvests a year. The Unfinished Obelisk - still rooted to the bedrock of pink granite and sail around the unique islands in aswan to visit the temple of Isis on Philae Island. 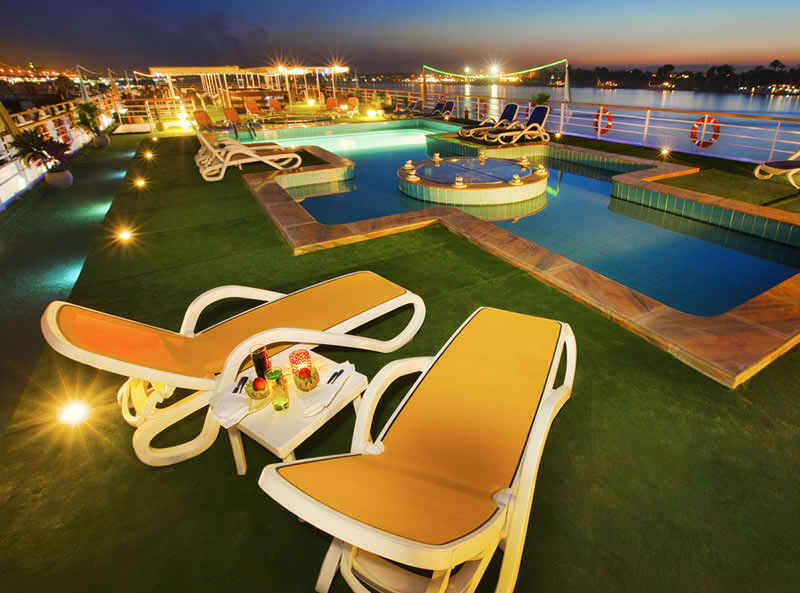 Overnight at Aswan. Leisure day with an optional excursion to the ancient wonder of Abu Simbel. Visit the most magnificent East bank temples the stunning Temples of Karnak, visit also the Luxor temple which also dedicated to the Theban triad of the god, Amun, the ‘unseen one’, his wife Mut, goddess of the heavens and their son Khonsu. The reliefs here are remarkably clear, partly due to the fact that it lay buried under sand for thousands of years. Note: It may be necessary to amend the itinerary due to prevailing local circumstances. 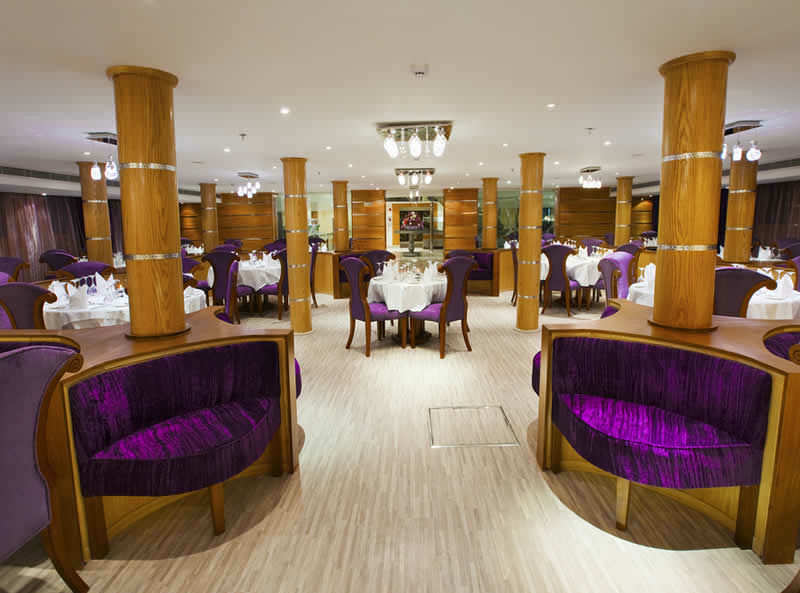 We will endeavour to provide you with as much notice as possible. 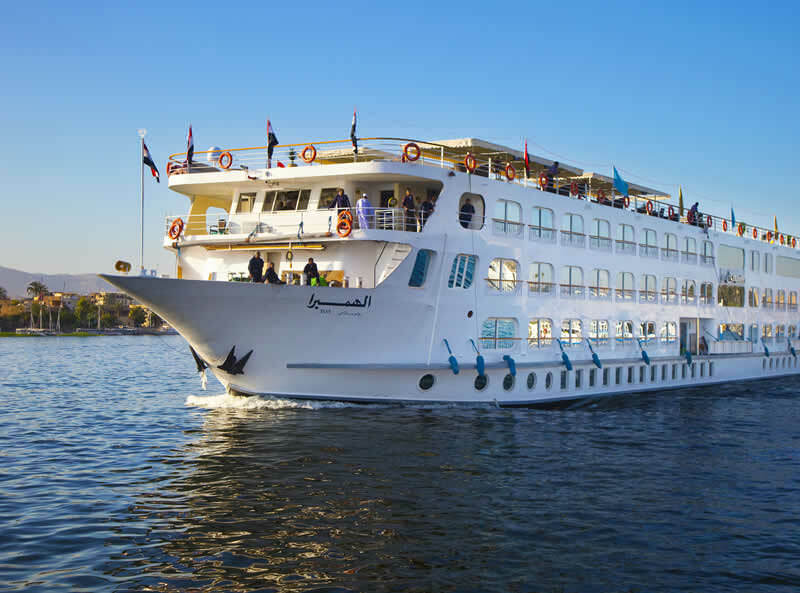 As so many sites are visited, a Nile Cruise may not be suitable for the very elderly, people with walking difficulties or children. Please note that some excursions may take place very early in the morning. Optional excursions shown may be available to pre-book, and where a tour is capacity controlled and participants are limited it may be advisable to do so. All tours/activities/excursions are operated by local, independent suppliers and your contract will not be with us, but with them, subject to their terms and conditions. When booked locally we are not responsible for the availability, operation, or any risks that may be involved with these tours/activities/excursions.